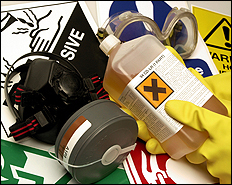 United Enviro Systems can complete a simple task or provide you with an entire “turnkey” hazardous waste management service. United Enviro Systems, Inc. Provides a “turn-key” approach to hazardous and non-hazardous waste management. All aspects of a waste management program including, buut not limited to, technical field services, document preparation, transportation, recycling/treatment/disposal, regulatory assistance and training audits, and emergency response can be provided to suit our client’s needs. United Enviro Systems, Inc. provides all the necessary services relative to the consolidation, packaging, and subsequent transportation and disposal of your waste materials. UES will also move your laboratory to a new site. While coordinating with your moving company to ensure the least amount of downtime for your chemists. All services performed by UES are in accordance with applicable state and federal regulations. The following items illustrate the depth of our commitement to provide comprehensive waste management services to our clients. UES provides experienced, fully trained technical field personnel. Training includes 40 Hour OSHA HAZWOPER, Respiratory Protection, Confined Space, PPE, CPR, USDOT Hazardous Materials, and more. UES will prepare all documentation necessary to obtain approval and ship waste properly.